The front page of the site has been Christmas-ified. 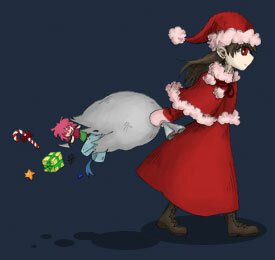 On Christmas Ib, Santa Ib will come to your house. I really wanted to draw a big illustration or the like as I did for Halloween, but that's not looking likely with how many things I have to do. I wanted to draw everyone around a cake... and a Christmas tree decorated with balls of paint. It's gonna be rough for New Year's, too!